VPN, also known as virtual private network, is a private network that extends across a public network. It adopts packet encryption and destination address conversion to realize remote access. There are three main VPN tunneling protocols - PPTP, L2TP and IPSEC. PPTP and L2TP are working at OSI layer 2, which are called layer 2 tunneling protocol, while IPSEC is layer 3 tunneling protocol. Let’s introduce how to establish VPN connection in Four-Faith router. Enter web configuration page of Four-Faith router, choose “VPN”->”PPTP”.Enable PPTP server. 2.2.1. The server IP can’t be same with client IPs, you’d better set a IP for server IP. 2.2.2. You can set serial IPs for client IP, like this: 200.200.200.2-200.200.200.100. 2.2.3. User name and password for client should be separated by *, and there should be space between user name ,* and password. 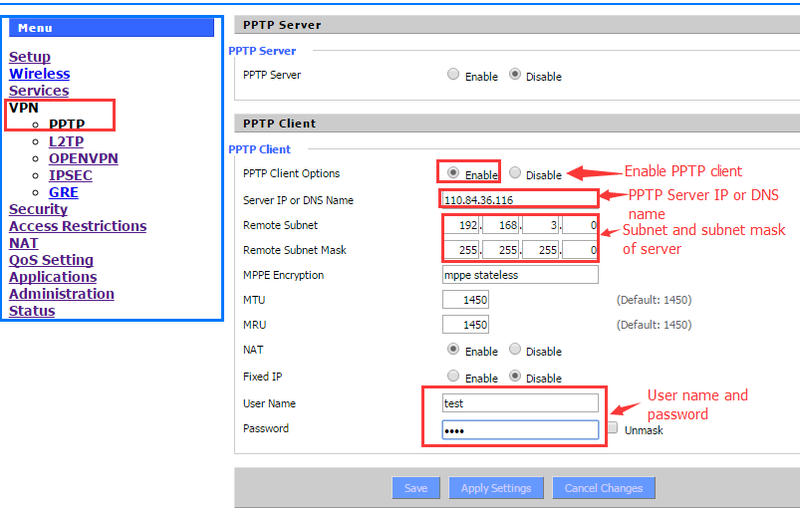 Enter web configuration page of Four-Faith router, choose “VPN”->”PPTP”.Enable PPTP client. 2.3.1. Server IP and DNS name should be a public static IP or the domain name. 2.3.2. Remote subnet and remote subnet mask should be the subnet and subnet mask of PPTP server. 2.3.3. Use the user name and password which set in PPTP server. 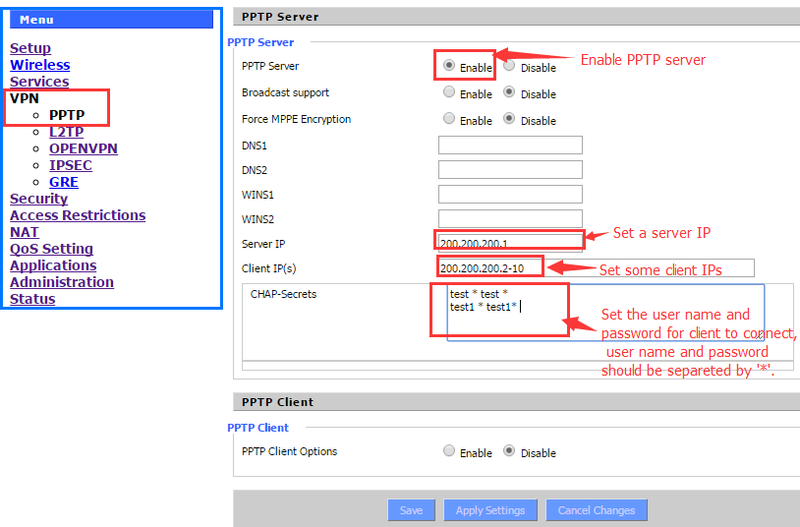 We can check the PPTP status in web configuration page when PPTP connection is established. “Status”-> “Lan”. Enter web configuration page of Four-Faith router, choose “VPN”->”L2TP”.Enable L2TP server. 3.2.1. The server IP can’t be same with client IPs, you’d better set a IP for server IP. 3.2.2. You can set serial IPs for client IP, like this: 200.200.200.2-200.200.200.100. 3.2.3. User name and password for client should be separated by *, and there should be space between user name ,* and password. 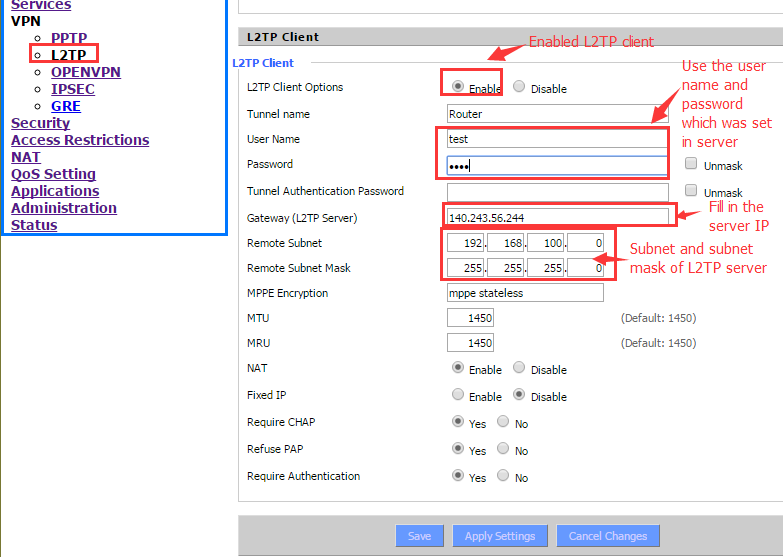 Enter web configuration page of Four-Faith router, choose “VPN”->”L2TP”.Enable L2TP client. 3.3.1. Server IP and DNS name should be a public static IP or the domain name. 3.3.2. Remote subnet and remote subnet mask should be the subnet and subnet mask of L2TP server. 3.3.3. 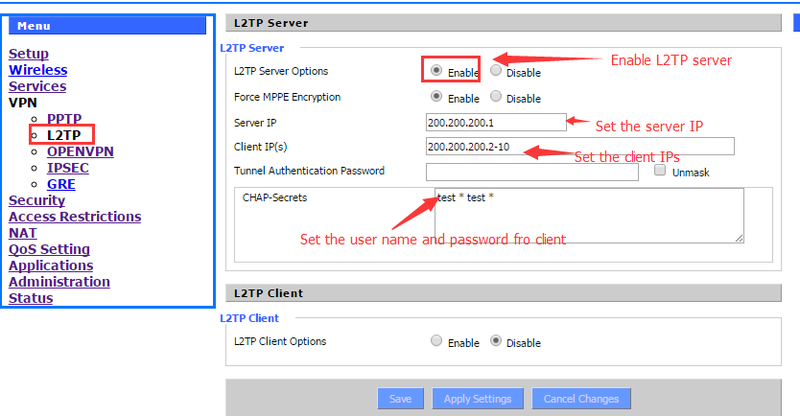 Use the user name and password which set in L2TP server. We can check the L2TP status in web configuration page when PPTP connection is established. “Status”->” Lan”. Four-Faith router can also work as IPSEC server. Enter Four-Faith router configuration web page, choose IPSEC. Click “Add” button to add a IPSEC connection. 4.2.1. You need to add /24 after the local subnet and peer subnet, and local subnet can’t be same with peer subnet. 4.2.2. 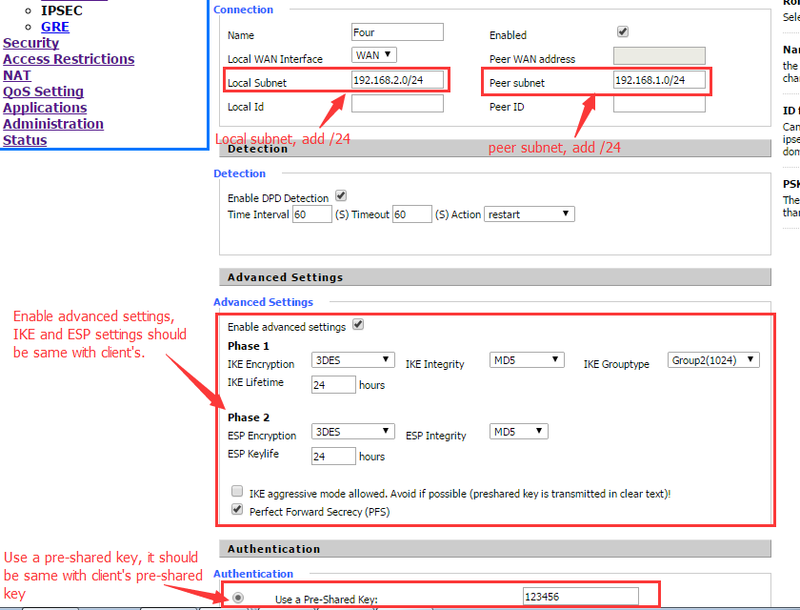 Enable advanced settigns, IKE and ESP settings should be same with IPSEC client. 4.2.3. Use a pre-shared key, the key should be same with client’s. Enter Four-Faith configure web page. Choose “VPN”->“IPSEC”.Click “Add” to add a IPSEC connection. 4.3.1. Peer wan address should be the IPSEC server IP, it should be a public IP or domain name. 4.3.2. You need to add /24 after the local subnet and peer subnet, and local subnet can’t be same with peer subnet. 4.3.3. 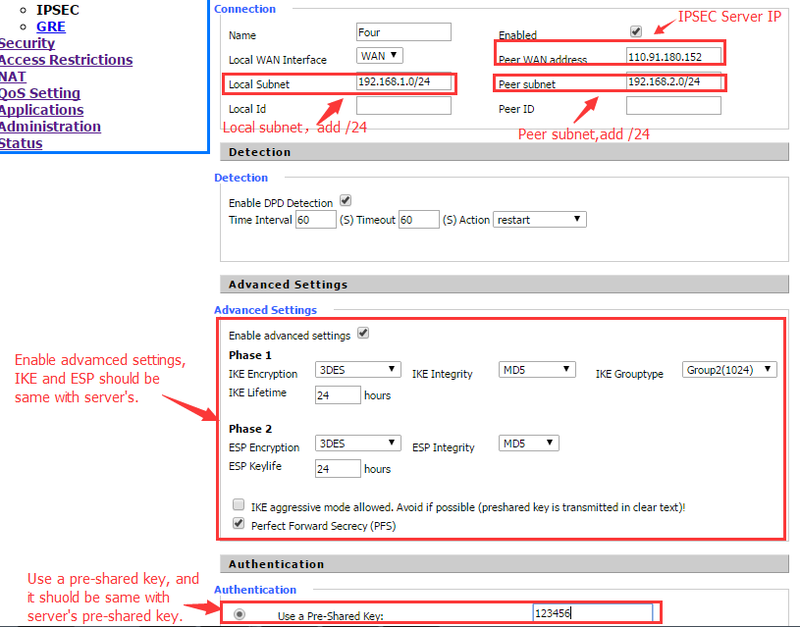 Enable advanced settigns, IKE and ESP settings should be same with IPSEC server. 4.3.4. Use a pre-shared key, the key should be same with server’s. You can check the IPSEC status when then connection is established. 5.1. Save money. It can save the cost of communication, equipment and technical support. 5.2. More secure.To ensure the safety of communication, VPN adopts four safety techniques, that are tunneling technique, encryption technique, key management technique, and authentication technique. And the users in Internet can only see the public IP address when the VPN packets are transferring through Internet. 5.3. Easy for network expansion.Engineers just need to do little settings if they want to extend the capacity and coverage of VPN. 5.4. More convenient. Employees outside the headquarter, business partners and other people who need access to remotely can connect to the enterprise network using VPN connection based on their local network. 5.4.1. Engineers in enterprise can’t control the property of VPN. 5.4.2. It’s not easy for enterprise to establish VPN connection. 5.4.3. The VPN products and VPN solutions from different companies are not compatible. 5.4.4. It’s not very safe to use VPN if we use wireless devices. next page：What is the difference between a DTU and IP Modem?